Fall color comes to many places but those of us in colder climates tend to forget about warm places like Florida. Fall color does reach the Sunshine state as proven by Simply Susan! One of my favorite trees for fall color (the sweet gum tree) is highlighted in her recap of November where she also includes a look at some gorgeous bald cypress trees. One characteristic that is very unique to these trees in Florida - Spanish Moss! Go check out Susan's Fall Color Project post, proving that fall color really does exist in Florida! How About Some California Fall Color? I bet you thought the fall color was all finished up for the year! Not so if you're in California, or here! The blog Town Mouse and Country Mouse has a beautiful display of fall color that has been decorating the gardens and landscape for several weeks now. I've been wanting to show off my CA natives in their fall colors for a while. We've had an unusually long and colorful fall season, though many of the most stunning displays are street trees that are not native to the area. So make a quick trip to California and pay Town Mouse and Country Mouse a visit! Do You Love Japanese Maples? If you don't then Tanya's post at My Secret Garden is not for you. But really who doesn't love a Japanese maple? 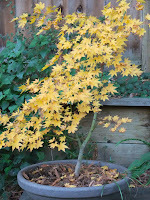 These Japanese maples are from Tanya's trip to a Japanese maple nursery in Washington. Japanese maples are one of the coolest fall color trees around, just imagine what the nursery looks like in fall! Oh wait, you don't have to imagine, just visit Tanya! Fall Color From a Foggy Fall Morning! Ginny from the blog Ginny's Garden brings us a foggy fall morning to peep at the peek fall color in her North Carolina garden. Japanese maples, sassafras, Virginia creeper, and dogwoods are ablaze with color. Her garden looks much like it was last week here in Tennessee! 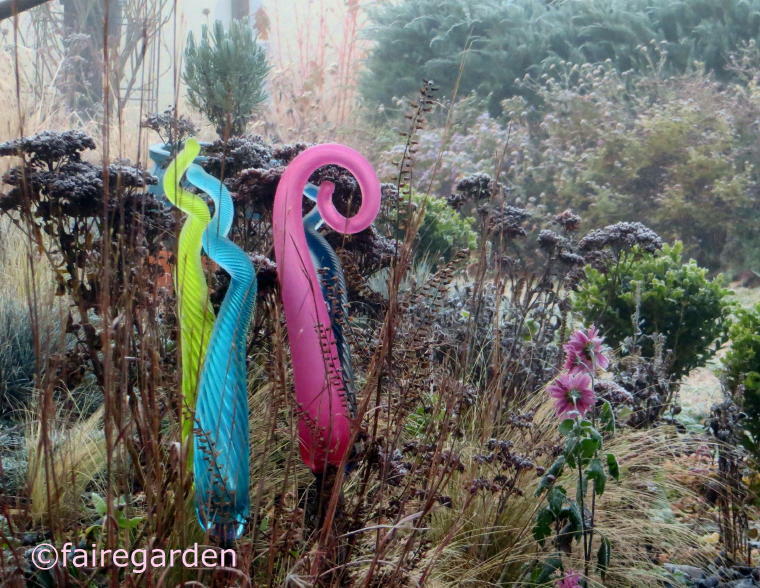 This fall we have seen some amazing colors and Ginny's Garden is no exception. "The fall color changes by the day, sometimes by the hour. Soon the dogwoods will be bare and the chestnut oaks will be fully turned." 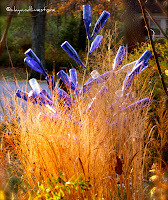 The Fall Color Project is hosted each year by Growing The Home Garden. Visit the Fall Color Project for more information on how to participate! Rose has been a contributor to the Fall Color Project before and we're glad to have her aboard for another round of fall color! Maples, fothergilla, hydrangeas, rough eared dogwoods, and several other great fall color plants are brightening up her fall. "The older I get, the more I love autumn. Crisp, cool days--a welcome reprieve from the summer's sweltering heat--the smell of ripe apples falling from the tree, the hum of combines harvesting the fields." 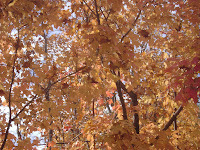 Go stop by her blog in Central Illinois to check fall color brought to you by Prairie Rose! 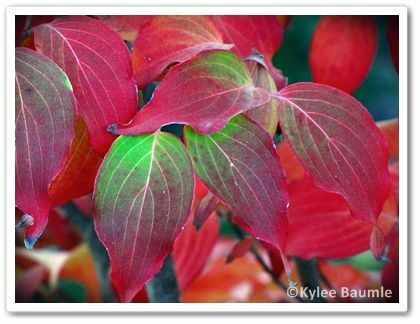 For this morning's fall color update we travel up to Ohio where Kylee of Our Little Acre has put her trees on display. Japanese maples, dogwoods (like the one in the picture to the left), amsonia, and bald cypress are all prominent features in her landscape. Kylee's 'Koto no ito' Japanese maple has a really interesting leaf shape and the fall color makes it appear that fireworks are in the garden. If you want more awesome fall color Ohio is a great place to look! Gail at Clay and Limestone certainly has the right idea about fall, Take Time to Sit! So often I worry about getting things done (as I am presently) that I forget to take time to just enjoy the garden and the work that has been accomplished. Really what better time of year is there to do this than fall? It's the time when the garden rewards the gardener! Today, I will sit in the garden and revel in the beauty. I hope you will, too. I will soon Gail, although it may have to wait until tomorrow! Welcome to the Fall Color Project! Here on these pages bloggers from all over are presenting and posting the best of the fall color their region has to offer! If you would like to join in and see what the Fall Color Project is all about check out the Fall Project from 2010, 2009, or 2008. For More information on how to join in look here! PJ Fusco to Speak on Local Search - SEO expert and regional director of organic search at iProspect PJ Fusco is set to speak on the topic of “Getting Local Write” in New Orleans in April.